With the new Dima Ovtcharov Line, Donic-Schildkröt sets high standards in quality and responsible producing, being an approved table tennis manufacturer. 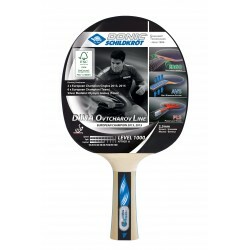 The Donic Schildkröt table tennis bat Ovtcharov Level 1000 is a high-quality table tennis bat made of sustainable FSC® wood for advanced playing techniques with good spin and high speed. The Donic Schildkröt table tennis bat Ovtcharov Level 1000 convinces by excellent features: a high-quality competition wood, a 2.1 mm thick Energy rubber, and systems developed by Donic-Schildkröt.